Investment research firm Morningstar has released their annual 529 College Savings Plans analyst ratings for 2018. While the full research paper appears restricted to paid premium members, this is still useful as while there are currently over 60 different 529 plan options nationwide, the majority are mediocre and there is really no reason to put your hard-earned money into them since anyone can invest in any state’s 529 plan. Here are the Gold-rated plans for 2018 (no particular order). Morningstar uses a Gold, Silver, or Bronze rating scale for the top plans and Neutral or Negative for the rest. All 4 of these plans were Gold last year as well. There were no new additions or subtractions. Here are the consistently top-rated plans from 2011-2018. This means they were rated either Gold or Silver (or equivalent) for every year the rankings were done from 2011 through 2018. These were also the same as last year. No particular order. People. Who’s behind the plans? Who are the investment consultants picking the underlying investments? Who are the mutual fund managers? Process. Are the asset-allocation glide paths and funds chosen for the age-based options based on solid research? Whether active or passive, how is it implemented? Parent. How is the quality of the program manager (often an asset-management company or board of trustees which has a main role in the investment choices and pricing)? Also refers to state officials and their policies. Performance. Has the plan delivered strong risk-adjusted performance, both during the recent volatility and in the long-term? Price. Includes factors like asset-weighted expense ratios and in-state tax benefits. State-specific tax benefits. Remember to first consider your state-specific tax benefits via the tools from Morningstar, SavingForCollege, or Vanguard. Morningstar estimates that an upfront tax break of at least 5% can make it worth investing in your in-state plan even if it is not a top plan (assuming that is required to get the tax benefit). Nevada 529 Plan has low costs, solid automated glide paths, a variety of Vanguard investment options, and long-term commitment to consistently lowering costs as their assets grow. (It is not the rock-bottom cheapest, but this is often because other plans don’t offer much international exposure, which usually costs more.) This is only plan that Vanguard puts their name on, and you can manage it within your Vanguard.com account. This is the keep-it-simple option. Utah 529 plan has low costs, investments from Vanguard and DFA, and has highly-customizable glide paths. Over the last few years, the Utah plan has also shown a history of passing on future cost savings to clients. This is the option for folks that enjoy DIY asset allocation. Since I like to DIY, I have the majority of my family’s college savings in this plan. Morningstar offers their own additional insight into the Gold-rated plans. I feel that a consistent history of consumer-first practices is most important. Sure, you can move your funds if needed, but wouldn’t you rather watch your current plan just keep getting better every year? Tuition inflation is something that I think is hard to predict. However, I couldn’t think of anything better than accepting the default assumptions that investment return will only barely outpace tuition inflation. If you’d rather have a quick, simple scenario, check out this Vanguard article on the power of automatic savings. If you put away $130 a month automatically every month for 18 years, at a 6% return you’d end up with $50,000. Putting away $50 a month reliably would get you to $20,000. Nearly half of your final amount would be due to investment growth, which thanks to the 529 plan can be tax-free when used towards qualified educational expenses. I’m still in the camp that retirement should be prioritized over college savings, but I definitely understand the parental instinct to provide the best educational opportunity possible. I’m still pondering the idea of targeting funding college with 1/3rd savings, 1/3rd spending from current income, and 1/3rd grants/scholarships/loans. Finally, here is another set of handy Vanguard tools, a 529 Plan Interactive Comparison Map and Tax Deduction Calculator. 5/29 is “529 College Savings Day”, and several plans are offering promotions and/or giveaways through the end of the month. Here is a NY Times article with some helpful information and here is a interactive 50 state map listing promotions. Just putting in $50 every month could add up to nearly $20,000 at the end of 18 years (6% return). California Scholarshare 529 – Bonus expired 6/1/18. Remember, you can open a plan from any state even if you are not a resident (although promotions and state tax deductions may be restricted). Also, you can do a rollover from one state plan into another state plan once every rolling 12 months. Updated for 2018. Let’s say you are fortunate enough to be able to make a large contribution to a 529 college savings plan, perhaps for your children or grandchildren. 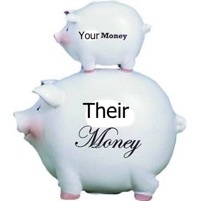 You read from multiple sources that you are able to contribute up to $75,000 at once for a single person or up to $150,000 as a married couple (2018), all without triggering any gift taxes or affecting your lifetime gift tax exemptions. (From 2013-2017, these numbers were $70k/$140k). What you are doing is “superfunding” or “front-loading” with 5 years of contributions, with no further contributions the next four years. Those are pretty big numbers, but any contribution above $15,000 will require you to file a gift tax return because that is the annual gift tax exclusion limit for 2018. ($14,000 for 2013-2017.) 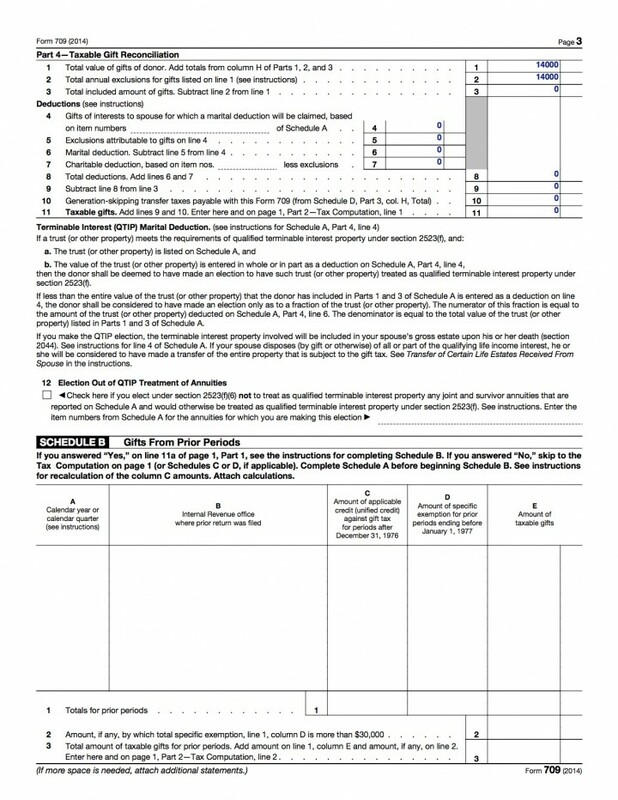 You’ll need to fill out IRS Form 709 [pdf], “United States Gift (and Generation-Skipping Transfer) Tax Return”. The instructions are quite long and confusing. You ask your accountant and they suggest talking to your estate lawyer. You may wish to avoid paying the $400 an hour or whatever it will cost as the form should be pretty straightforward. 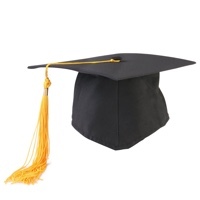 IRS Form 709 Instructions, section on Qualified Tuition Programs. Here’s a redacted version of my completed Form 709. Let me be clear that I am not a tax professional or tax expert. I am some random dude on the internet that did his own research to the best of his abilities and filled out the form accordingly. This is what my form looks like. It could be wrong. You’ll need to make changes to conform to your specific situation. Feel free to offer a correction, but please support your statement. For my version, I am assuming that you and your spouse contributed the maximum $140,000 together. (I didn’t actually contribute that much.) The 2014 form is shown below, but I just did this for another kid using the 2017 form and I couldn’t find any differences. Note that you’ll need to file two separate gift tax returns, one for you and one for your spouse. Mail them to the IRS in the same envelope, and I like to send them certified mail. – Donor made a gift to a Qualified State Tuition Program (a 529 plan). – Total amount contributed $140,000 in 2014. – Donor elects pursuant to Section 529(c)(2)(b) of the IRS Code of 1982, as amended to treat the gift as having been made equally over a 5-year period. – The gift was made jointly by the taxpayer and the taxpayer’s spouse on January 1st, 2014 and will be split equally in half. – Election made for $140,000 over 5 years is equal to $28,000 total per year, or $14,000 per person per year. When to file Form 709. 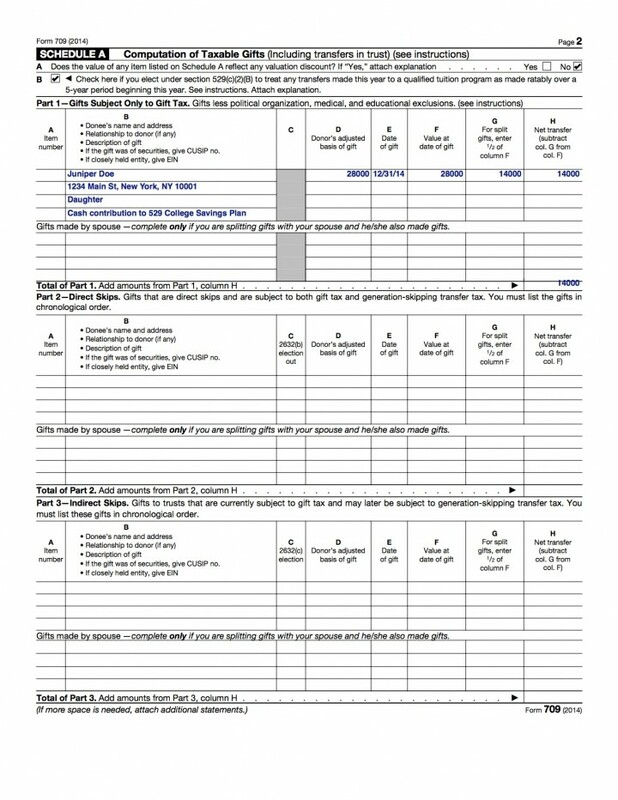 When taking the 5-year election, you must fill out the gift tax return (Form 709) by April 15th of the year following the year in which in the contribution was made. So if you make the contribution in 2018, you must file Form 709 by April 15th, 2019. If you make the upfront contribution in the first year and then make no future contribution in the next four years, you do not have to file a gift tax return after the one you did for the first year. What if you’re late? Well, you should file the Form 709 as soon as possible. If you did not exceed the limits then technically there is no gift tax due, and there is no penalty that I could find for late filing when there is no taxes due. Still, I would file ASAP. The tax information set forth in this article is general in nature and does not constitute tax advice. The information cannot be used for the purposes of avoiding penalties and taxes. Consult with your tax advisor regarding how aspects of a 529 plan relate to your own specific circumstances. If you are interested in online college education, definitely read How Open University Works: An Insider’s Perspective by Manoel Cortes Mendez. The Open University (OU) is a public, nonprofit UK university that was founded in 1969 with a focus on distance-learning. I was not familiar with the OU at all before reading this. In this article, I retrace my steps at the OU, from enrollment to graduation. The goal is twofold: first, to give you a sense of what it’s like to study with the OU; second, to highlight particular aspects of the OU experience that aren’t readily apparent from the outside, but that every prospective student ought to know. The author earned a Bachelor’s degree in Computer Science from the OU, spending a total of $18,000. He is now halfway through the Online Masters in Computer Science from Georgia Tech. Unlike most Open University (OU) students, who are usually in their mid-thirties, I joined the OU in my early twenties. I chose the OU over a brick university because I had started working full time after high school, and I wanted to continue working during my university studies. Furthermore, I lived in Belgium, but I envisioned my career in the US. So I wanted to study in English and my degree to be recognized internationally. As it happens, the OU is one of a handful of UK universities to be fully accredited in the US. That settled my choice. Despite its unconventional mode of delivery, the OU is on paper a university like the others. More precisely, it’s a recognized body in the UK, which is british legalese for fully accredited. And it’s one of the few UK universities to also be regionally accredited in the US. So if after your OU degree, you want to pursue further studies in a brick university, you can. And this includes prestigious universities. For instance, one of my OU classmates went on to study a master’s degree in computer science at Oxford University. In other words, a degree from Open University has a certain level of respect and reputation for high-quality education (at least in the UK) that is not present at many for-profit US universities. Would it be possible for there to be an equivalent institution in the US? How many US residents have gotten undergraduate degrees at Open University? I bet they would get more foreign applicants if they renamed it to something that sounds traditional like “London-Bletchley University”. Maybe I’m foolish, but I remain hopeful about the potential of software leading to more affordable, accessible education. 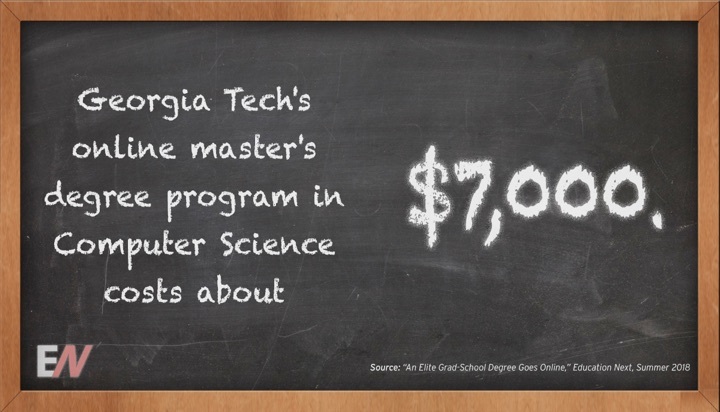 In 2014, Georgia Tech launched an Online Master of Science in Computer Science (OMSCS) with the goal of offering an accredited, top-tier education at a surprising price of $7,000. The program has been regularly ranked in the Top 10 by U.S. News & World Report, and the traditional residential program costs $28,000 two years of tuition (out-of-state, not including housing). OMSCS offers the same lectures from the same professors, the same homework assignments, and the same exams. A few other top universities have online versions of their masters programs, but they charge the same tuition as in-person ($40,000+). The diploma is exactly the same as those of on-campus graduates, with no special “online” designation. Would there be enough interest from qualified candidates? Would it remain financially viable? Would the online program cannibalize from the traditional on-campus program? Would employers discriminate if they found out that this was an online degree? Would the careers prospects be different due to the lack of in-person networking opportunities? EducationNext recently published an article An Elite Grad-School Degree Goes Online addresses some of these questions. InsiderEd has a an article Online, Cheap — and Elite that summarizes the findings. Analyzing the first six cohorts of the online program, from spring 2014 to fall 2016, the report found that the typical applicant to the online program was a 34-year-old midcareer American, while the typical applicant to the in-person degree was a 24-year-old recent graduate from India. Of the 18,000 students who applied to the in-person and online degrees, less than 0.2 percent applied to both, the report said. Overall, the program has been a success in terms of expanding access to high-quality computer science education. Total enrollment is now over 6,000 students. The questions about career effects will be addressed in future studies. In 2017, Georgia Tech announced a new Online Masters Degree in Analytics for under $10,000. This is also a nationally-ranked Top 10 program where the traditional in-person tuition ranges from $36,000 for in-state students to $49,000 for out of state. The data analytics program is an interdisciplinary collaboration between the College of Engineering, College of Computing and the Scheller College of Business. 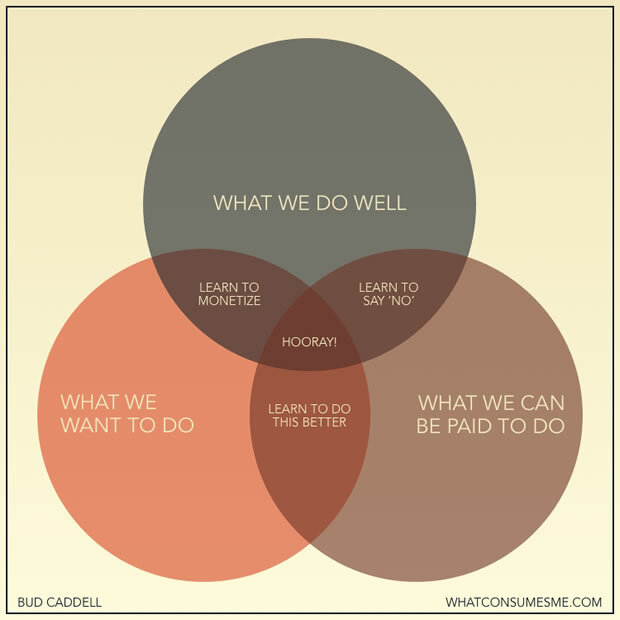 A lot of financial articles are all about optimizing or finding the “best”. The best bank account, best credit card, best mutual fund, etc. However, this CurrentAffairs.org article Nothing For Money takes a different perspective. They outline three “Bullsh– Financial Products” (BFPs) that are never, ever worth the money. There is no “best” to recommend. The best advice is to simply avoid them completely. Overdraft Protection. The banks say they only want to offer “help” with this “protection”, but then why did it require governmental intervention make it opt-in only? You may be opted-in today due to old rules or by accident (you can still call them and opt-out). The fact is that most people would probably save money overall if it didn’t exist and banks simply rejected the transactions instantly. I would really love to hear from anyone who has had a positive experience with overdraft protection. If you exist, write in and let us know about an instance when you were glad to pay your overdraft fee in order to have your transaction processed on the spot. What was the transaction? Why was it worth the extra $35 or whatever the fee amount was? Why was that better than using a credit card if you had access to one? Student Loan Assistance. 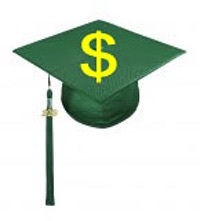 Student loans are big business and unfortunately the long list of options can be confusing. Don’t let one of these outfits take advantage of you. So the student loan assistance companies will literally charge you many thousands of dollars to do something that: a) is not even necessarily the right thing for you; and b) is extremely easy and fast to do yourself if it is the right thing for you. Payment Accelerators. I am also a big proponent of DIY payment acceleration. I have never found a payment accelerator program that I would recommend to a family member. First, they generally charge you a lot. The companies that do this for your mortgage will sometimes charge you a full mortgage payment up to $1,000 to start the program, and then a fee of $5 or so every time they withdraw a payment from you, which is usually every two weeks. If you used a payment accelerator for your whole 30-year mortgage, you’d pay almost $5,000. There are also companies that do this mainly with auto loans. They charge a little less, but it’s still a lot. Most of them will charge you $399 at the beginning and then $2-3 per withdrawal, again usually every two weeks. So for a five-year loan, even if you pay it off six months early, you’re still looking at almost $700 in fees. Starting in 2018, qualified educational expenses for 529 plans will include up to $10,000 a year in tuition and expenses for primary and secondary school expenses (public, private, or religious). Previously, you could only use it towards qualified college expenses. There were also some related changes to ABLE accounts for individuals with special needs – listed here. Put simply, you can now pay for up to $10k a year of private K-12 school through a 529 plan. If this impacts you, you may consider making a 529 contribution now before December 31st, 2017 as you are allowed annual contributions of $14,000 per person ($28,000 per couple) while still avoiding gift taxes. You would then be able to make contributions in both 2017 and 2018. Front-loading a 529 early and with a lot of money. The NY Times lays out a scenario where a wealthy family puts in $200,000 at birth (not sure why they use this amount as it would exceed annual gift tax limits even with front-loading) and then uses the money to pay for K-12 private school. This could theoretically save a wealthy family $30,000 in taxes. If you have that kind of money, it may be worthwhile to explore front-loading, but be careful as their example assumes a reliable 6% return every single year. In the real world, investment returns can be quite volatile, and if you make a $10,000 withdrawal every year, you run the risk of depleting your account entirely before college. Other possible options are to start funding a 529 even before your child’s birth to start accumulating those future tax-free capital gains. Using the 529 as a just-in-time passthrough. Around 30 states offer a in-state tax benefit on 529 plans. If you are paying for a private school anyway, you may be able to save some money by simply using the 529 as a passthrough account. Contribute to 529, grab the tax benefit, and then immediately withdraw (starting in 2018) to pay for K-12 tuition. Some states like Montana and Wisconsin specifically disallow this in-and-out practice, but most do not (although they could start). Things can still change. This Reuters article points out that states may change their own laws in response. 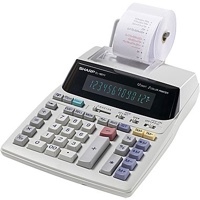 They could add minimum holding periods, cap their deductions, or add income restrictions. I am also curious as to what, if any public school “expenses” are technically eligible. Personally, I don’t think this will change my 529 usage plans significantly. My state does not offer a tax benefit, so there is little benefit to the passthrough option. Maybe if short-term rates go up high someday and you can earn 5% in a bank account, it might become worth the effort to park some money in there temporarily. The other primary benefit is federal tax-free investment gains, and it takes a while for that compounding action to accumulate. If I get lucky and my balance gets really big, I could perhaps see taking some money out before college if they end up in private high school. Realistically though, I doubt my balances will greatly exceed four years of college tuition (times three kids!). Amongst the many things to consider at years-end is a contribution to a 529 college savings account. (I just made my contribution for kid #3.) In addition to the federal tax-free growth towards qualified college expenses, more than 30 out of 50 states offer some level of tax deductions for 529 contributions. Some require you to contribute to the official in-state plan, while others let you contribute to any plan. SavingForCollege.com offers a visual comparison of these state tax benefits in the following infographic. 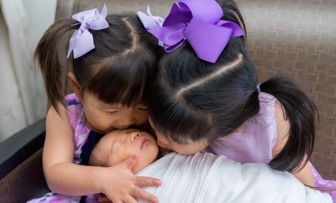 They assume a couple filing jointly with a $100,000 taxable income and contributing $100/month for each of two children. The darker the blue, the bigger the benefit. How Much Do Other Parents Help Pay For College Tuition? Morningstar State-by-State 529 Tax Benefit Comparison 2015 – Provides a different perspective, but 2015 numbers may be outdated so please confirm independently. Investment research firm Morningstar has released their annual 529 College Savings Plans Research Paper and Industry Survey. While the full survey appears restricted to paid premium members, they did release their top-rated plans for 2017. This is still useful as while there are currently over 60 different 529 plan options nationwide, the majority are mediocre and can quickly be dismissed. Here are the Gold-rated plans for 2017 (no particular order). Morningstar uses a Gold, Silver, or Bronze rating scale for the top plans and Neutral or Negative for the rest. The Bright Start College Savings Plan from Illinois was upgraded to Gold this year due to a manager change and thus an entire new set of investment options and age-based tracks. The new plan is cheaper and removed a $10 maintenance fee. The other 3 plans were Gold last year as well. Here are the consistently top-rated plans from 2011-2017. This means they were rated either Gold or Silver (or equivalent) for every year the rankings were done from 2011 through 2017. No particular order. Performance. Has the plan delivered strong risk-adjusted performance, both during the recent volatility and in the long-term? Is it judged likely to continue? State-specific tax benefits. Remember to first consider your state-specific tax benefits that may outweigh other factors. If you don’t have anything compelling available, you can open a 529 plan from any state (I would pick from the ones listed above). Also, if you like an in-state plan now but your situation changes, you can roll over your funds into another 529 from any state. Nevada 529 Plan has low costs, solid automated glide paths, a variety of Vanguard investment options, and long-term commitment to consistently lowering costs as their assets grow. This is only plan that Vanguard puts their name on, and you can manage it within your Vanguard.com account. This is the keep-it-simple option. Utah 529 plan has low costs, investments from Vanguard and DFA, and has highly-customizable glide paths. Over the last few years, the Utah plan has also shown a history of passing on future cost savings to clients. This is the option for folks that enjoy DIY asset allocation. I feel that a consistent history of consumer-first practices is most important. Sure, you can move your funds if needed, but wouldn’t you rather watch your current plan just keep getting better every year? More specifically, they found that high employability doesn’t always match up with higher earnings. In the following chart, the plotted the percentage of recent college graduates with jobs requiring a college degree against the median wage of those recent graduates. High rate of “full” employment, higher earnings. Chemical Engineering, Nursing, Economics, Accounting, and most majors in the STEM fields. High rate of “full” employment, lower earnings. Education-related majors. Low rate of “full” employment, higher earnings. Political Science, Marketing, and International Affairs. Low rate of “full” employment, low earnings. Theology, Criminal Justice, Performing Arts, English Literature, History, and Philosophy. Just because there are lots of jobs in your chosen field, that doesn’t mean your job will pay well. Just because your major has high average income, that doesn’t mean you’ll be able to find a job in that field.